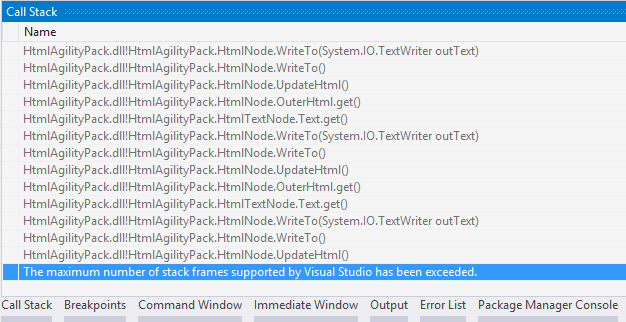 "The maximum number of stack frames supported by Visual Studio has been exceeded." Side notes: I'm already using sjdirect's HAP fix. Here is a snapshot (it repeats like this all the way). Is there a way to enlarge the number of stack frames Visual Studio can track, to at least as much as the application can allocate before filling its stack? Or can the reverse be done, namely reduce the stack size of the debugged application? The problem with StackOverflowExceptions is that they are so deep, that the stack effectively gets trashed. This page has a recursive example that causes this condition that ends up with 80,000 levels on the stack. Considering VS last I read is still a 32-bit app that emulates 64-bit for debugging, you may be blowing well past the available memory for VS to manage the amount of stack levels for you. There is no apparent feature as to restrict the stack size of the CLR application or increase Visual Studio's tracked stack frame count. Thank you for your efforts and I hope this helps somebody else.